The Smithsonian invites the public to celebrate Black History Month in February through a series of vibrant performances, talks, family activities and exhibitions at its various museums. All programs are free unless otherwise indicated. 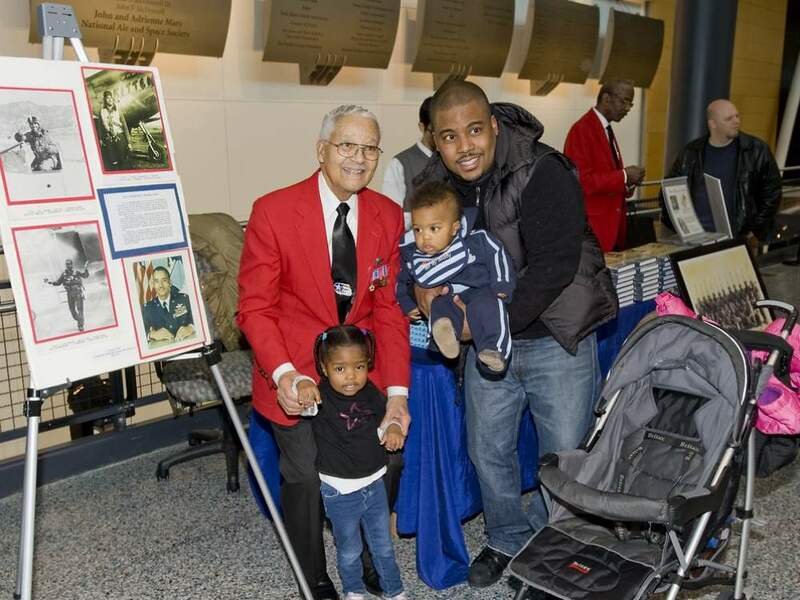 On Saturday, Feb. 9, the National Air and Space Museum will host “African American Pioneers in Aviation and Space Family Day.” Visitors are invited to meet African American pioneers in aviation, learn about Hal Walker’s laser experiments used on the Apollo 11 mission and enjoy puppet shows and hands-on activities. The celebration includes a presentation and book signing by Tuskegee Airmen Col. Charles McGee. Garifuna historian and cultural advocate James Lovell will share his Afro-Indigenous heritage in conversation and through music in “Native Sounds Downtown!” at the National Museum of the American Indian’s Heye Center in New York. The performance begins at 6 p.m. and will feature percussionists and dancers. On Friday, Feb. 22, the Smithsonian American Art Museum will present “Between Worlds: The Art of Bill Traylor” symposium. Exhibition curator Leslie Umberger will lead a distinguished group of scholars who will provide new insights and information about how one man’s visual record of African American life gives larger meaning to the story of the nation. The symposium will be in the museum’s McEvoy Auditorium from 1 to 6 p.m. A schedule of speakers and panels is available at www.americanart.si.edu. On Saturday, Feb. 23, from 2 to 4 p.m., the Anacostia Community Museum will host a talk with author Eugene Myers about his book Five for Freedom: The African American Soldiers in John Brown’s Army. In his book, Myers recounts the story of the 1859 raid on Harpers Ferry, with a focus on the lives of five African American men whose stories have long been overshadowed, and whose role in the raid continue to have social relevance today. Registration is available at www.anacostia.si.edu or at (202) 633-4844. Saturdays, Feb. 2 and 23, 10:30 a.m.–1:30 p.m. This two-part workshop is led by master quilter and author Dianne Dale. Participants will learn basic sewing techniques to put together a useful, easy-care family heirloom quilt. Participants are asked to bring 6–12 shirts. Registration is available at www.anacostia.si.edu or at (202) 633-4844. Wednesday, Feb. 6; 1:30–3:30 p.m. Visitors can explore the figurative art of the ancient Kingdom of Benin. Participants will make observations of the development of the stylized treatment of facial features (especially the eyes). All skill levels and ages welcome; participants under age 16 must be accompanied by an adult. Availability is on a first-come, first-served basis. Attendees will learn various research methods and record types to discover how to research their family history beyond 1870, into the era of slavery. The workshop will be held in the Robert F. Smith Family History Center on the second floor of the museum, and will be led by the center’s staff. RSVP is required at familyhistorycenter@si.edu (limit two per person). Sunday, February 17; 10:30 a.m.–3 p.m. Participants will learn to create and edit new articles about African American artists. All levels of technological proficiency are welcome. A special tour of SAAM’s African American art collection starts the program at 10:30 am. The event is free, but registration is required at SAAMPrograms@si.edu. Visitors can drop in for an afternoon of unique card design using Adinkra symbols with local graphic artist designer Sharmila Karamchandani. All skill levels and ages welcome; participants under age 16 must be accompanied by an adult. Availability is on a first-come, first-served basis. On Saturday, Feb. 9, at 3 p.m., the Smithsonian American Art Museum will screen Black is the Color, a documentary that looks at African American art from 1867 to today, featuring works by Edmonia Lewis, Kerry James Marshall and Jean-Michel Basquiat. Before the film, Jason Nichols, hip-hop artist and lecturer at the University of Maryland, will perform an opening rap. Following the screening, Myrtis Bedolla, founder and director of Myrtis Galerie Baltimore; Tuliza Fleming, curator of American art at National Museum of African American History and Culture; and Melanee C. Harvey, assistant professor of art history in the Department of Art at Howard University will discuss the film. Rated G (52 minutes; 2017). The National Portrait Gallery’s Education Center hosts Portrait Story Days on Saturdays and Sundays from 1 to 4 p.m. Participants can listen to stories of noteworthy figures from American history and work on art projects inspired by their lives. Featured figures for African American History Month are Toni Morrison, Tuskegee Airmen, former President Barack Obama and Michelle Obama. Select Mondays in February, the National Portrait Gallery’s Young Portrait Explorers will focus on Obama. Toddlers age 5 and up, with their adult companions, can learn about the former president through storytelling of art and history. Registration is required at npg.eventbrite.com. Wednesday–Friday, Feb. 20-22 at 11:30 a.m. This musical play chronicles the struggles and triumphs of pioneering African American baseball players. Recommended for ages 6–12. Thursday–Friday, Feb. 7 and 8 at 10:15 and 11:30 a.m. This Discovery Theater original introduces some of the lesser-known heroes of African American history.